In October 2013, developer Crescent Heights announced that New York celebrity chef Suvir Saran would open an 8,500-square-foot restaurant on the ground floor of NEMA, a 700-unit apartment complex at 10th and Market streets. “I can’t begin to express my excitement about launching a restaurant in San Francisco and in the NEMA building particularly,” Saran said at the time. And more than four years later, all of the 13,500 square feet of retail space at NEMA sits vacant — a blank glass wall fronts Market Street instead of the lively shops and restaurants the developer had promised. But Crescent Heights, which did not return calls seeking comment about the status of the space, is not alone when it comes to empty retail spaces in newly constructed buildings. In a city where ground-floor retail is often required in residential developments, much of the new stock sits empty. A look at 20 housing developments on or within a few blocks of Market Street between Castro Street and Fifth Street — all completed within the last five years — found 17 vacant storefronts, about 45 percent of the total. While some of the empty spaces are relatively new, like the three storefronts at 181 Sanchez St., others, like NEMA, have been around for four or five years and have yet to land tenants. The situation is similar on Fourth Street in Mission Bay, which is being billed as the nascent neighborhood’s shopping corridor. Only two retailers have moved in on the east side of the street, while entire blocks of storefronts remain vacant. To the north, at the 410-unit L7 project at 1222 Harrison St., the biggest recent development in SoMa, all five spacious retail spaces are empty, although signage indicates one has been leased to a furniture shop. While housing developers lean heavily on local nightlife and retail in luring renters or buyers to their properties, interest in those matters often doesn’t seem to extend to their own buildings, said Gail Baugh, vice president of the Hayes Valley Neighborhood Association. The sluggish pace at which many of these spaces are being filled is a symptom of the weak retail sector, as well as high construction costs and zoning restrictions that limit what can go into many of the spaces, developers and brokers say. Brian Spiers, a San Francisco builder who constructed the 115-unit Linea project at 1998 Market St. and is currently developing 60 units at 2100 Market St., said he understands why neighbors push against chain stores and prefer smaller spaces that are more amenable to mom-and-pop outlets. But bringing in retailers that fail doesn’t help the neighborhood either. Brokers point out that broad categories of retailers — clothing, shoes, hardware — are losing market share to online sales and are contracting, not expanding. And the categories that are growing and looking for space — banks, medical services, gyms, cannabis dispensaries and offices for everything from real estate agents to architects — are not always popular with neighbors and require authorization from the Planning Commission, which can be costly and take up to year. The onetime staple of urban neighborhoods — the corner store — is completely absent from the new developments. While revenue at corner stores is often driven by the sale of booze, new liquor licenses are prohibited in many neighborhoods. Daniel Sider, senior adviser for special projects at the Planning Department, said the department is looking for ways to open new convenience stores, places that sell everything from fruit and veggies to toilet paper to lottery tickets. But it’s challenging. But not all the news is gloomy when it comes to retail in new development. Over the past year, Equity Residential has opened three projects in or near Showplace Square: One Henry Adams, which has 150 units and 8,600 square feet of retail; 855 Brannan St., which has 434 units and 16,000 square feet of retail; and 1010 Potrero, with 453 units and 14,000 square feet of retail. Since March, Equity has signed 10 retail leases in the three complexes totaling 20,855 square feet, said Drew Sullins, vice president of development. The new leases include the San Francisco taco bar El Pipila, the wood-fired pizza spot SoMa Slice, a Peet’s coffee outlet and the falafel restaurant Truly Mediterranean. California College of the Arts will open a new flex space for gallery exhibitions, screenings and events. Sullins said Equity’s retail consultants are involved in every step of the design and construction process, and retail is regarded as an amenity for residents. One group taking advantage of the city’s development boom is the Boba Guys, who have opened locations at the 8 Octavia condominiums in Hayes Valley and at 1010 Potrero Ave.
Olivia Simorangkir (right) prepares a beverage at the Boba Guys milk tea bar on the ground floor of the 8 Octavia condos. 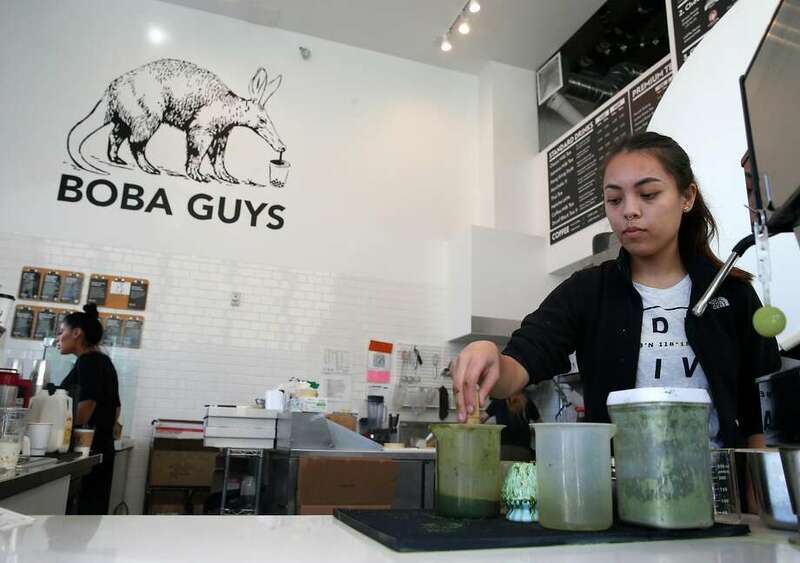 Boba Guys co-founder Bin Chen said owners of new developments are increasingly reaching out to his milk tea group, which started on 19th Street in the Mission. Chen said that he and his partners were lucky in that Equity Residential and DM Development, the builder of 8 Octavia, were willing to take a chance on operators “off the beaten path” with limited experience and no outside investors. That has not been true of other developers, he said. “It’s hard to just tax landlords who are keeping spaces vacant on purpose or because they have a higher expectation of rent versus those who are trying but can’t find tenants,” she said. Peskin said he is looking at a modest fee for property owners, which would cover the cost to the city of keeping the space vacant — it could cover things like trash removal and grafitti remediation, which are more common in front of empty spaces.